In the latest issue of Inside History, issue 29, we share an excerpt from the book In All Respects Ready: Australia’s Navy in World War One (by Oxford University Press), which explores the important role that the 1st Royal Australian Naval Bridging Train played in Gallipoli a century ago. Here, Inside History chats to David Stevens, the book’s author – and Australia’s foremost naval historian – about the personal stories he uncovered in writing and researching the book and why Australia’s naval history remains undervalued. West Beach, Suvla, Gallipoli. 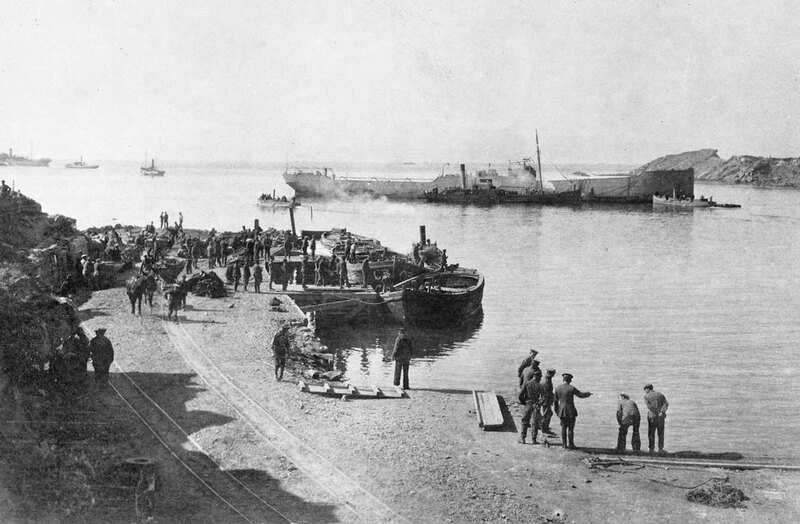 The 1st Royal Australian Naval Bridging Train is here placing an old hulk in position to act as an outer breakwater for the boat docks. Courtesy AWM, ID P01326_008. IHM: What originally drew you to researching naval history? David: As a professional naval officer I thought it important to gain a more thorough understanding of the history of my service. In particular, I wanted to separate the myth from the reality. Only in this way could the organisation truly benefit from the knowledge and experience gained by the sacrifice of those who had gone before. Fortunately, I have been able to translate this interest into an ongoing career. IHM: What aspects of naval history in World War One do you wish more Australians knew about? David: Just about everything. Australia is a maritime nation and a century ago the only credible threats to our interests came either at sea or from the sea. Unfortunately, the myths of our military history have skewed our understanding of how important the oceans remain to our ongoing security. The dearth of naval history in our collective memory means that few Australians realise that powerful German warships were present in the Pacific in 1914, understand just how far our ships roamed and what threats they forestalled, or appreciate the nature and variety of the achievements of our naval men and women. IHM: In All Respects Ready draws on a range of previously untapped sources. Which resources did you find most helpful in the course of your research? David: Because the story of our wartime Navy has received so little attention, there remains much to be discovered. The records held at the Australian War Memorial, the National Archives of Australia in Canberra and Melbourne, and the National Archives in London were of prime importance, as were the original diaries of naval men preserved in various other institutions. I was particularly grateful to the families who responded to a call for papers and photographs that I placed in Vetaffairs, the newspaper of the Department of Veterans’ Affairs. IHM: What were some of the challenges involved in researching Australia’s naval history in the First World War? David: Because our warships spent a lot of their time overseas, many of the records are held in overseas repositories, particularly the United Kingdom. At the same time it was important to find perspectives from the other side, and this meant looking into archives in the United States, Germany and Turkey. IHM: The book tells the story of the war – from pre-war plans for a Pacific War as early as 1909 through to the 1918 Armistice – alongside the personal experiences of naval personnel. Why did you decide to highlight these personal stories? David: The chronicling of where Australian warships went and what they did is only one aspect of the whole story. By including pen portraits of a selection of naval personnel, not always a member of the ‘great and the good’, it was possible to reflect on a far wider range of experience. How else could I highlight the stories of an officer who never served in an Australian ship, but who did command an armoured train on the Western Front, or a sailor whose record for ‘playing up’ made him a legend among his contemporaries? Three RANBT officers pictured outside the sandbagged dugout that acted as the Wardroom at Kangaroo Beach, Suvla Bay. Courtesy AWM, ID P11155.007.001. IHM: Was there any information or personal stories you uncovered that stopped you in your tracks, or touched you personally? David: In wartime there is no shortage of tragic stories. One that particularly struck me, concerned the mother of an Australian sailor who had died in a Turkish prisoner of war camp in 1916. He was one of four brothers lost to the same family during the war, leaving the mother as sole support to four young daughters and an invalid husband. Because the naval son had disappeared from his sick bed with no record of burial, it was difficult for authorities to determine his date of death. More than three years passed before the family received his outstanding pay. Another story that comes to mind was that of an officer who played a key role in the Australian operations to occupy the German territories in the Pacific, including the capture of a German warship. He went on to command a British survey vessel / minesweeper in the North Sea and received high praise for surveying the enemy shore while under fire. Yet, despite this recognition, he suffered from a deep depression exacerbated by the malaria he had picked up in the New Hebrides, and shot himself in March 1918. He was as much a war casualty as any who died by enemy action. IHM: What would be your top tips for researchers who want to learn more about Australia’s naval history? David: Have a look at the website of the Naval History Section of the Sea Power Centre – Australia. This site is updated regularly and is a great place to start researching your naval ancestors. It already includes many photographs, digitised documents and historical articles. The hardworking staff in the section are also very helpful when it comes to pointing out where to look next. David: The story of the RAN’s role in naval intelligence gathering is still very unclear. Some great work has been done, but there are still many questions that remain unanswered.